Pictured is Noel with his parents: Peterhead footballer Rory McAllister and wife Ashley. 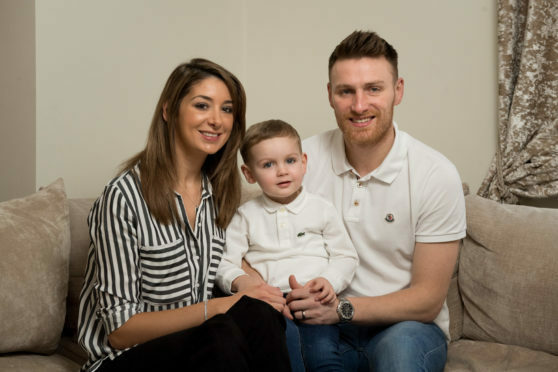 A north-east football star and his wife have praised medical staff for saving their son’s life after he was struck down by pneumonia. Peterhead FC forward Rory McAllister and wife Ashley were left reeling when three-year-old Noel became seriously ill after becoming unwell on New Year’s Day. The youngster developed breathing problems and a bad cough and was referred to Royal Aberdeen Children’s Hospital where an x-ray revealed the lung condition. He was subsequently transferred to the hospital’s high dependency unit, where he was given an ultra-sound scan to test the severity of the condition and also had a chest drain inserted to remove fluids from his chest cavity and lungs. His parents were told surgery was necessary due to the discovery of empyema, an infection in the lung cavity caused by bacteria. However, after dealing with the shock of seeing their son being taken away to the operating theatre, the couple were given worse news. Mrs McAllister, a business travel consultant, said: “There was a long pause before the surgeon spoke. He explained that he had opened Noel and he was worse than he expected. “When they operated, they found his lower left lobe had a severely infected abscess which they cut away. “A tear at the top of one lung was repaired and two chest drains inserted to clear fluid. The surgeon explained that Noel would have to be transferred to another hospital for highly-specialised intensive treatment, and he was flown to Edinburgh Children’s Hospital. The couple’s next 17 days were spent by Noel’s bedside, as they willed their child on with his battle. Eventually, he recovered well enough to be transferred back to the north-east, and was taken home by his parents. But, within a few days, he developed chicken pox and, the following week, his breathing problems returned – an x-ray revealed pneumonia had returned to his right lung. Thankfully, now he is back in the Aberdeen family home, Noel is thriving.